Gainsight is great for managing customer interactions through the customer lifecycle and understanding how to successfully keep your customers on a path to success via using your product or service. Gainsight is great if there are multiple data sources that aren't easily viewed in a combined way or if users do not have access to all these data sources. Gainsight provides a way to get this information into one area that is easy to view by anyone that is involved with the account. It also allows for data back to other systems like Salesforce which is important for contributors that may not be in Customer Success. 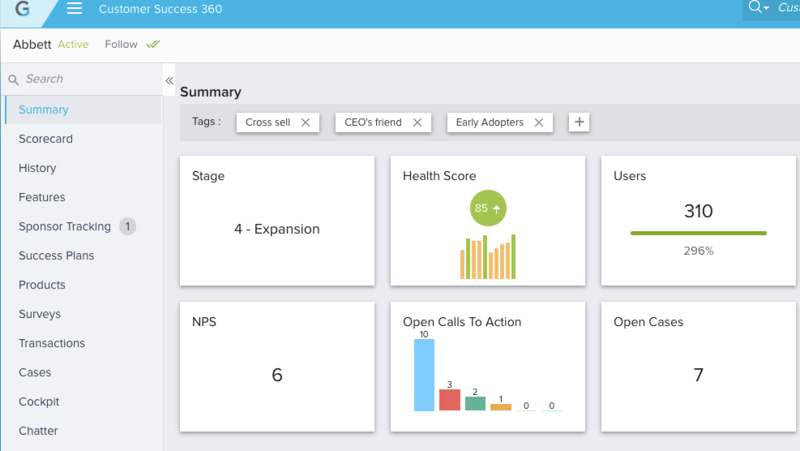 Gainsight is helpful for automation as well as building scenarios with a specific goal in mind - all of which helps with scaling across segments. In other areas, Gainsight can be harder for users to adopt if they are used to different workflows like working from support cases or direct email. It also doesn't have much machine learning that would increase the ability to automate workflows. If your product isn't true SaaS you can't make as much use of some of the areas of Gainsight that work well with usage data. 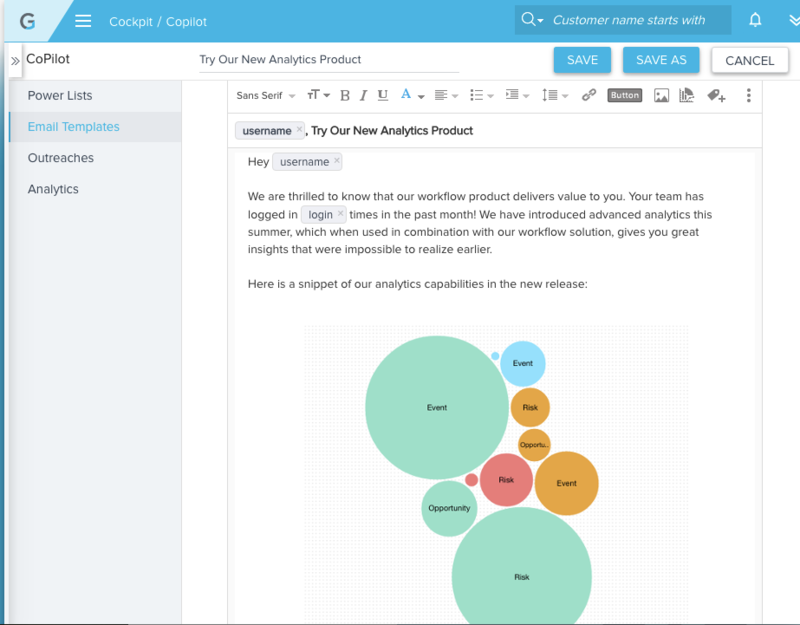 Gainsight is also good for workflows that produce an output - an email, a survey, etc. - but not as good with taking inputs from customers. 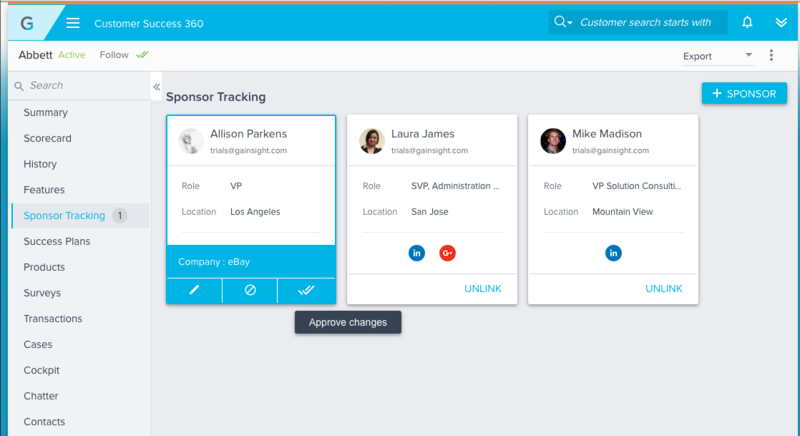 Gainsight is the keystone solution for a customer-centric SaaS organization looking to proactively operationalize the engagement of a team of Customer Success Managers, Sellers, Support people, and other customer-facing resources. Insights into recurring revenue should be objectively based on objective customer data. Gainsight provides the insight along with the suggested tasks that will secure greater revenue retention. 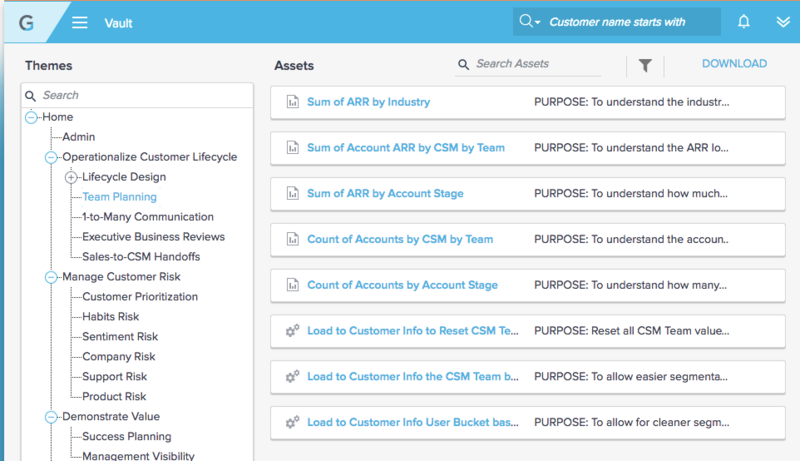 Gainsight is a powerful tool and I've used it at two companies to define the work and outcomes of CSMs. If you have a multi-product offering and need to manage the post sales experience, this tool is perfect. If you are smaller, you could live in your CRM tool until you are ready. If you have a team of people responsible for customer success Gainsight provides various ways to keep track and anticipate client needs. If you want to create 'tasks' for users to take action on regarding client data. 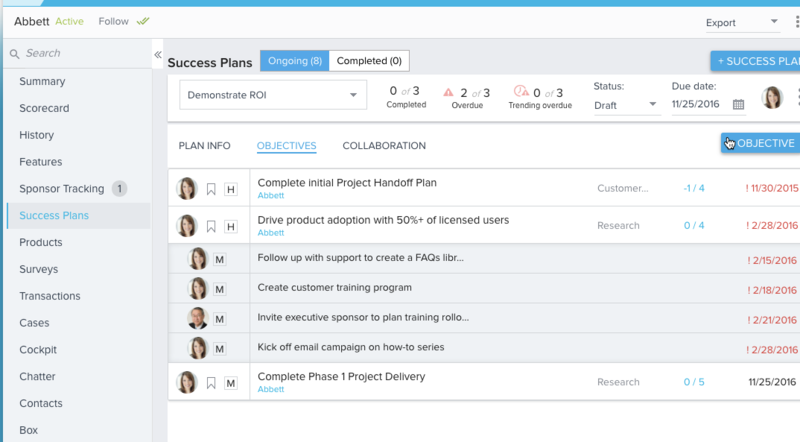 If you despise time-based workflows from salesforce, Gainsight provides working alternatives. Extremely useful if manager to client ratio is in excess of 1: 50 (meaning 1 account manager to 50 clients). Gainsight helps you manage and track clients activities and engagements. For CSMs to track all types of engagements with their customers and categorize them. e.g. Timelines. Transitions: all historical information is at your finger tips, you don't need to search through emails. I can identify action items and owners easily. Less appropriate: Success plans and workflows. If you're managing relationships with between 25 and thousands of customers, Gainsight offers the tools to have insight into those customers and ensure you're given them the attention they need. However if your SFDC or CRM system and other data sources are poorly managed, Gainsight won't fix those issues, they need to be sorted out before starting the GS implementation. Great tool, great people, great partners, and great road map. Once you get into this program you may find that the number of users that require licenses increases and you need to make sure you have thought this through in the beginning. Gainsight is well suited for anyone teams which have a large customer base. This is the only way to keep track of touch-points being due, renewal dates or any risk with the account (Cockpit/CTAs are great for this). For me, Gainsight is a great tool in almost all scenarios, especially if these are related to metrics or usage data within direct customers of any organization. 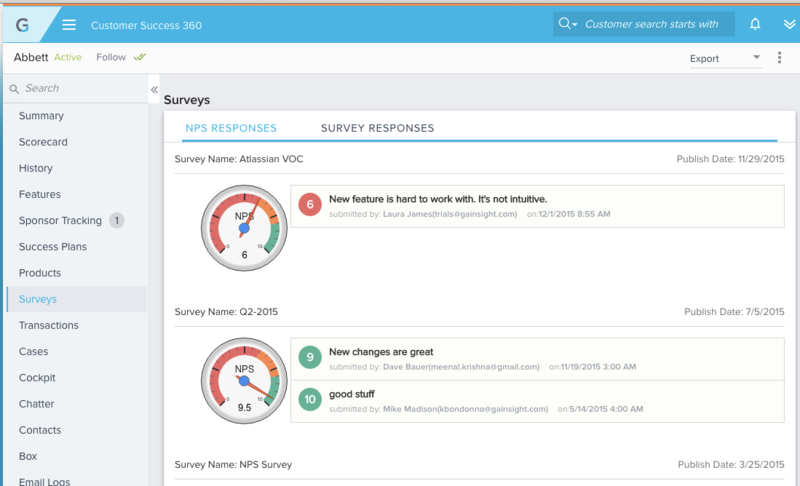 Also, Gainsight can be a great tool for any organization that would like to measure their relationship with their customers and understand where there are areas for improvement. I think Gainsight is not a great tool to use by an organization that would like to measure their employee's performance or how happy they are with their job roles. Gainsight is not an HR tool. When you have a lot of unstructured customer-facing motion conducted by humans a workflow engine like Gainsight makes a lot of sense and is best of breed. If you're looking for automated stack of tech touch, Gainsight plays a role but there's other tools that can fit that stack. Gainsight works really well for lifecycle-based communications that are intended to feel personalized and look like they are a one-to-one communication even when they are not. 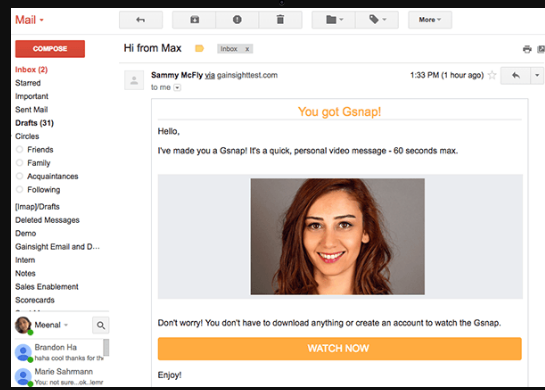 We have found Gainsight to be less appropriate when sending mass marketing communications that need A/B testing, HTML programming, heatmap click tracking, and so on. Easy to setup, tons of online tutorial resources, and a great and helpful Gainsight community. Early indicators of churn risks, great CTA/reports, and a great renewals process. Great customer support, actually one of the best. Gainsight is a fantastic tool for account managers and client success managers to monitor usage, schedule regular outreach, and track the overall health of an account. It's less appropriate for salespeople, because this functionality is designed more for account managers due to the fact that the information is pulled from the product. For prospecting efforts, it is not necessary and there are other tools that are better designed for these activities. Gainsight is great for organizations that have a customer focused environment, but need to take it to the next level. They are truly leaders in this space and can help you reach a new level of success in your organization. 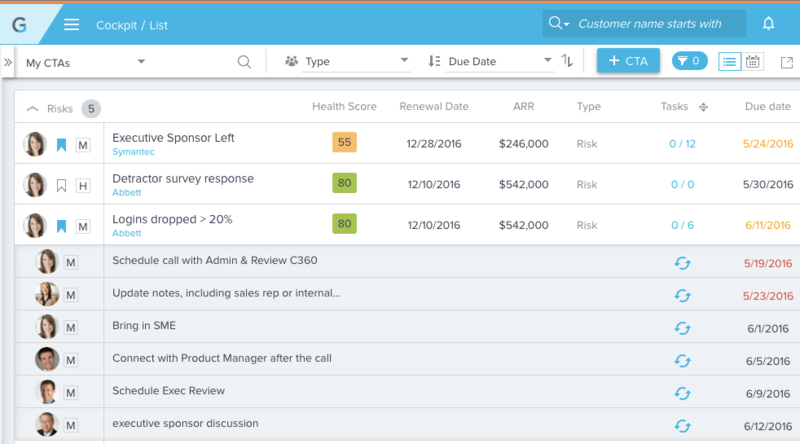 Gainsight can be leveraged as a day-to-day CSM platform to track customer health, interactions and engagement. It is less helpful for sales or other functions. It does require focused resources to get the data integration correct, so allocation of technical resources up front is critical. A technical administrator within the customer organization is optimal for maintenance.